The Christmas carol “I Heard the Bells On Christmas Day” was originally a poem. Written by Henry Wadsworth Longfellow, it was arranged and set to music by John Calkin, who took it upon himself to edit out two stanzas which refer directly to the Civil War, thereby creating yet another easily forgettable holiday musical offering and entirely gutting the meaning of the original 1863 work. By that time, 1863, even the New England abolitionists were appalled aby the amount of blood and violence their cause had created. Although the Emancipation Proclamation was signed on January 1, eight hundred thousand slaves outside the Confederacy were not covered under its authority. The War seemed no closer to ending than when it had started, despite Union victories at Gettysburg and Vicksburg. The summer of Union optimism had turned into its winter of discontent. Although Longfellow condemned slavery, he was not a fire-breathing abolitionist. He was, however, a close friend of Charles Sumner, who was. Sumner condemned “the peculiar institution” whenever and wherever he could, in harshest terms. Sumner delivered his infamous “Crime Against Kansas” speech on the floor of the Senate in May, 1856. This speech was particularly personal and inflammatory. Two days later, Preston Brooks, a Congressman from South Carolina and a cousin of one of the men insulted in the speech, approached Sumner and clubbed him over the head with his cane. Sumner was nearly killed. Twelve years before, in 1842, Longfellow had published a thin book of poems for Sumner’s group, The New England Anti-Slavery Association. 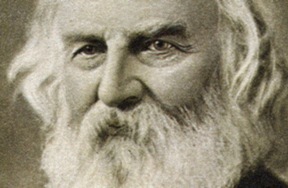 Longfellow himself claimed that the poems were “so mild that even a Slaveholder might read them without losing his appetite for breakfast,” but Sumner was satisfied with it, and the group reprinted it for further distribution. Longfellow followed politics closely and, by 1860, realized that there must be some sort of resolution to the problems which beset the nation. His most famous poem, “Paul Revere’s Ride,” was written in time for a Christmas publication in The Atlantic Monthly. He hoped it would be a call for a new Revolution, although he, like so many Americans, never envisioned one so long and brutal. 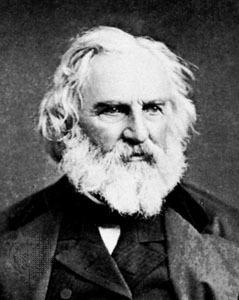 Longfellow, like many in the country on both sides of the conflict, endured a significant amount of heartbreak during the war. The fall of Fort Sumter, the secession of the southern states, including Virginia, and Great Britain’s declaration of neutrality were just some of the incidents that brought grief to the poet. The most personal tragedy was the death of his wife, Fanny, in 1861. Her clothing caught fire (a frequent occurrence at the time, unfortunately) as she lit the household candles, and she was badly burned. She died the next day, sending the writer into a prolonged period of grief. Two years later, their seventeen-year old son, Charles Appleton Longfellow, ran away and joined the Union Army. Initially, the distraught father did not know where to find his son. The young man had gone to Washington, D.C. to seek a friend, Captain W. H. McCartney, commander of the 1st Massachusetts Artillery. Not wanting to enlist the son of a family friend, McCartney wired Longfellow for permission for “Charley” to enlist. Patriotically, he gave it. The young man was soon promoted to Lieutenant, and his first combat experience came at Chancellorsville. In June, Charley contracted typhoid and malaria, and was sent home to recover. He rejoined his unit on August 15, 1863. On November 27, as part of the Mine Run Campaign in New Hope Church, Virginia, he was severely wounded by a bullet that entered his left shoulder, travelled across his back, nicked his spine, and exited the right shoulder. He was carried by ambulance to a field hospital on the Rapidan River, and then sent to a hospital in Washington. His recovery was not at all certain. Longfellow learned of his son’s injury on December 1, 1863, and left immediately, along with his younger son Ernest, to recover Charley. All during his journey to the capital, the father was not certain if he would be bringing back a wounded son, or a dead one. In the midst of his sorrows—the War, a dead wife, a young family to raise alone, and a son who hovered near death—Longfellow thought of all the other households in the Union whose holidays were marred, some forever, by the events of the last three years. He did what writers do: he wrote. The resulting poem was the one we know as “I Heard the Bells On Christmas Day.” The poem was not intended to join the pantheon of sugary sweet Christmas carols already in place. With peace on Earth, goodwill to men! Charley survived, and by December 8, he was back in Cambridge to recover at home. He lived, but the wound was considered too severe to allow Lieutenant Longfellow to return to his unit. He was mustered out on February 15, 1864. If you have already heard this story and wonder why repeat an old, sentimental chestnut, let me remind you. If we do not tell the stories of our past, whether it is a past just gone by, or one bound up in myth and legend, we will lose it, and so will future generations. There is no better gift to give than that of a memory. And if it is new to you, enjoy! This entry was posted in Civilian, Emerging Civil War, Personalities. Bookmark the permalink. Thank you! I so enjoyed reading about this part of our history and thankful that it has been preserved. The poem means so much more when we know the personal history of the one who wrote it. I agree we need all verses to be able to understand this beautiful poem. This makes it even more meaningful. History is being ignored or becoming pc…so sad! Hopefully that will change soon. Many teachers are not teaching the facts. And US history does not even have to be taught for people to get a degree in History. I love this story very much. We spent two Christmas’ with sons overseas in the military. We can readily empathize with Longfellow. His words are timeless; worry, despair and finally, hope. The true meaning of Christmas. PLEASE repost every year!! Heyyyyyyy that’s pretty good ?